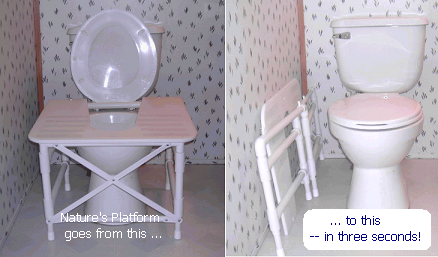 Nature's Platform can be customized to fit any toilet (at no extra charge.) See instructions when you check out. Human beings have always used this posture for elimination. Infants of every culture adopt it instinctively. Western Man switched to the sitting position about 150 years ago. 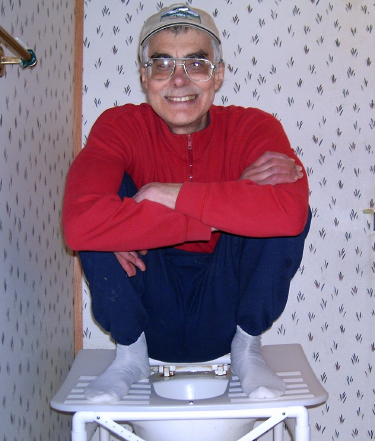 Two-thirds of the world still uses the natural squatting position. the posture is stable and relaxed. Stand with your back to the platform. Set one foot on the platform. Lean back, placing both hands on the platform. "The ideal posture for [evacuation] is the squatting position, with the thighs flexed upon the abdomen. In this way the capacity of the abdominal cavity is greatly diminished and intra-abdominal pressure is increased, thus encouraging expulsion ..."
is the standard textbook in the field. -- no need to balance on the balls of your feet. provides the strength and stability to support 300 pounds. Nature's Platform can be set up or folded up in three seconds. You never lift more than six pounds. The distance between the toilet bowl and the wall should be at least 5 inches on both sides. "I recommend Nature's Platform to all of my patients, especially to those who are plagued with chronic constipation, though this need not be the sole reason for using it. The health benefits of this position cannot be overstated. As a side benefit that I have not seen spoken of in the literature, the squatting position provides an excellent stretch for the low back and helps to stretch the ligaments and tendons of the ankles. 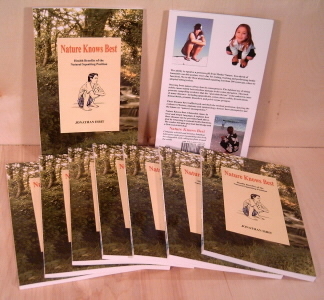 I believe that Nature's Platform will contribute to the relief of many chronic low back problems." Richard Grossman, L.Ac., O.M.D., Ph.D. 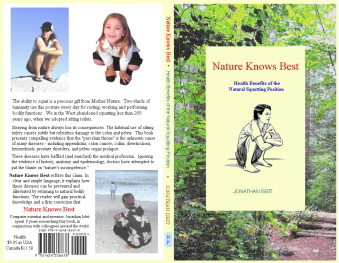 The first book to explain the importance of the natural squatting posture for the prevention and treatment of many serious diseases. Contains virtually the entire content of NaturesPlatform.com, in a convenient, easy to read format. 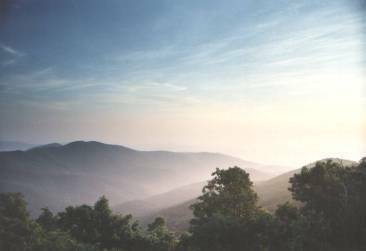 The Home of Nature's Platform. 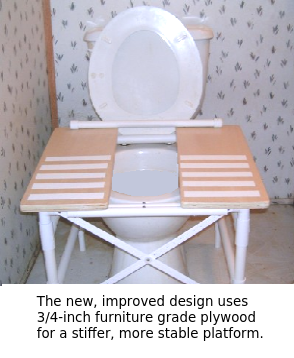 The frame is made of PVC plastic, reinforced with steel tubing. Sorry, but this product is no longer available. NaturesPlatform @ hotmail.com (remove the spaces before hitting "send"). We will give you the shipping costs and send a PayPal invoice if you want to proceed.